Childcare Situation: Nanny in the mornings and after school; full time in the summer — $400/week. 7:00 a.m. Sunday is my sleep-in day. I wake up first and enjoy quiet time with coffee and TV. I get dressed and get ready for Sunday morning “date” with my friend. 8:00 a.m. My friend picks me up and we do a Target run/coffee/social outing. This is something we try to do every week, but typically 2x/month. Running errands while being social accomplishes several things at once! 10:00 a.m. Arrive back home. Kids and spouse have eaten breakfast. Chat and relax with family. 11:00 a.m.–3:00 p.m. Laundry, lunch, and clean up kitchen. Then, food prep for the week occurs with me and spouse. We take turns hanging with the kids and prepping food. This involves prepping things for everyone for breakfast (egg cups, healthy muffins, granola bars, fruit, yogurt), lunches (DIY pizza boxes, giant salad for adults, smoothie bowls), and printing recipes for dinner. Kids play in house and outside to burn off energy. With the dietary restrictions (gluten, dairy), we make a lot from scratch. I also find food prep keeps me eating healthier throughout the week when I’m too tired to think about what to cook or eat. 3:00–5:00 p.m. Pay bills, family games, put clothes away, more adulting. 5:00–7:00 p.m. Cook dinner and eat as a family. My parents come over for dinner and we all have good quality time together. 7:30 p.m. Start to get kids to bed. 8:30 p.m. Kids fall asleep. I fall asleep shortly after. 10:00 p.m. Husband goes to bed. 4:25 a.m. Wake up, eat a snack, get ready and go to gym for class from 5:00–5:45. 6:00 a.m. Back home, I drink coffee, pet the dog, watch TV, and eat breakfast. It is 15 minutes of peace before the day. Then, get ready for the day. 6:30 a.m. Spouse leaves for work. Our schedules vary by day, so we balance who has early meetings and who can wait until nanny arrives. Today, I get lunches ready for kids and self, including snacks to get through the day. I also clean the dishes because I can’t stand dishes in the sink. 7:15 a.m. Nanny arrives. Share schedule for day and leave for work. 8:00 a.m.–4:00 p.m. Office day, including lots of meetings, lunch at my desk during meetings, and more meetings. 4:00 p.m. Leave to coach kids’ Lego League. 4:30–5:30 p.m. Lego League final practice for the season. The kids have come together and built a cute display. They get their team shirts today, which makes them super excited. 5:45 p.m. Everyone is home. Quick dinner and then I work more, as a few critical things did not get done today. Spouse keeps kids entertained, cooks dinner, and cleans up dishes. He’s a great partner. 8:00 p.m. Oops… a little late to start bedtime routine. Kids fall asleep closer to 9:00. I fall asleep shortly afterwards. The benefit is that we can coach one another and really understand what the other person may be going through at different times. The con — we can coach each other! :) It is nice to have access to each other’s calendars for planning and being able to shoot a quick IM when an issue arises with kids or other factors. We rarely carpool due to schedules and kids. It is occasionally awkward when our schedules and/or teams interact a lot, but overall, pros outweigh cons. 4:25 a.m. Wake up, eat a snack, get ready, and go to the gym. 6:00 a.m. Return home. Same routine of eating breakfast, drinking coffee, and getting lunches ready. 7:00 a.m. Spouse has a phone call — calls in from home in the basement. I leave for work. 7:15 a.m. Nanny arrives and gets kids ready and off to school. 7:30 a.m. Arrive at work just in time for first meeting. Meetings all day again. 5:45 p.m. Leave work. Thankfully, my parents agreed to make dinner. 6:00 p.m. I arrive at their house. The boys were already there, ate dinner, and left for martial arts class. My daughter is watching TV. 7:00 p.m. Daughter and I head home and clean out lunch boxes and get dishwasher going. We usually end up running at least one if not two loads per day. Get coffee pot ready for the morning. 8:00 p.m. Start bedtime routine late again. 9:00 p.m. Everyone is asleep. I LOVE my gym. It is about four minutes from my house, so that helps a TON. I’ve been going every day for over two years now without fail. There is a group of us that are really consistent, which helps for accountability and support. Example, this morning, one girl had a 4:30 a.m. babysitter so she could attend when her husband travels, and the other woman’s car wouldn’t start so her husband gave her a ride there and I gave her a ride home. It is really the only way I want to start my day. Also, getting up at 4:25 makes me go to bed earlier, otherwise it is REALLY painful to get up! Three things … made me start working out regularly, and then it took several months and different attempts until I found something I could do consistently. After work just didn’t work, and working out in the mornings at home was hit-or-miss (especially if my kids woke up and told me that I wasn’t doing it like the people on the TV… GAH!). 1) My husband was diagnosed with a life-altering disease several years ago, and through that experience and research, it was clear exercise was the best medicine and prevention. 2) A great friend of mine once told me she had a goal to ensure her kids grew up knowing that 30 minutes of exercise every day is just what you did, like brushing your teeth. 3) Through work, I did an online version of the Corporate Athlete and found that I had a lot of stress, but not enough “good stress”… I needed exercise in order to maintain enough energy throughout the day. Working out every day sets me off right and enables me to have the energy I need to go through the day. Until 8:00 p.m. Then I’m out. 4:25 a.m. Wake up, eat a snack, go to the gym. I stay for two classes today. 6:20 a.m. I get home, only then realizing I need to leave the house in 15 minutes to get to my 7:00 a.m. meeting. Quick shower, get ready. Spouse gets my lunch ready, I grab some snacks and egg cups for the drive. Eat on the drive. 6:59 a.m. Walk into meeting. Meetings all day. 3:30 p.m. Leave work to mentor at an elementary school a few miles away. I made a roller coaster experiment this month. This is something I started about five years ago. Each year, the teacher I work with gets a group of girls and we meet once per month. I teach them about different types of engineering and conduct a hands-on experiment. This month went great. 5:30 p.m. Head for home. My parents decided to make dinner again (which is wonderful and amazing!). 5:50 p.m. I arrive, eat dinner, and then take daughter to Girl Scouts. My spouse was already there. The boys leave for home the same time we leave for Girl Scouts. They can clean up lunch boxes and prep for the next day. 6:30–7:30 p.m. Girl Scouts meeting. (I’m the co-leader of the troop, but thankfully the other leader is way more active on the leading part and I’m more of a supporting role.) It is a great meeting and the girls have a ton of fun learning about waste, worms, and composting. I don’t get to spend a lot of time with my kids, so I try to be involved with their activities whenever possible. It allows us to connect at a different level and show them leadership in action. As for the STEM mentoring, there aren’t enough women in engineering and there are some key studies (STEMing the Tide is one) that showed girls lose confidence and interest between 4th and 8th grade. The biggest factor for them staying confident and engaged in math and science is having role models. The feedback from teachers on how confident the girls become through this program is so motivating. The program is for 4th and 5th grade girls, and it is one way I can help directly increase the number of women in engineering. Also, my daughter decided to quit Girl Scouts (or take a break? ), as she joined swim team and it was at the same time. I was able to move our troop to a different group and step away from that, which is nice. I still lead a STEM workshop for Girl Scouts in the area every 18 months. The first one had 200 girls participating, which was great to see. 4:25 a.m. Wake up, head to gym for two 30-minute classes today. 6:10 a.m. Home. I eat breakfast and get lunches ready. My spouse and I do not have a meeting until 8:00 a.m. We talk and enjoy a more relaxed morning getting everything ready. 7:27 a.m. We leave. We take different routes to work. I learn the hard way that my route is apparently slower, as my spouse is already parked and inside when I arrive. Note to drive his way to work going forward. 8:00 a.m.–5:45 p.m. Mix of meetings and some time to get some work done. Continue eating lunch at desk or during meetings. My parents decided to cook dinner at our house today, which again is completely amazing and awesome. 6:10 p.m. Arrive home, enjoy a clean kitchen and dinner on the table. If that isn’t a stress reliever, I’m not sure what is!!! Talk with parents about their day and plans. Discuss the weekend plans with spouse. Parents are leaving for a week tomorrow. 6:45 p.m. Leave house for concert at kids’ school. Concert is fun and only 30 minutes long. Thank you, school!! 7:50 p.m. Back home from concert. Get ready for bed. 9:30 p.m. Everyone is asleep. 4:25 a.m. Wake up, go to gym — two 45-minute classes today. Spouse has a 6:30 a.m. call from home, so I leave the gym a few minutes early. Get home and order online groceries for delivery later that day. Realize how much time has passed and get ready in record time. Grab food for lunch, lots of coffee, and head out door. Call nanny on the drive in to tell her about special attire day at school for kids. She is on her way to the house and has it all together. Kids are usually still asleep if I leave before 7:30 a.m. I miss seeing them in the mornings. 7:25 a.m. Arrive at work five minutes before first meeting. First meeting is with a fellow working mom and we enjoy a few minutes of discussing life before getting down to business. It is a nice way to start the day. 10:45 a.m. Head to a VIP lunch for a local STEM event across town representing company, stopping at UPS to pick up a case of wine that needs a signature on the way. Lunch is very inspiring, with students sharing their stories of success. UPS calls and has another package for me so I will need to go back. 12:45 p.m. Leave lunch and rush back to work for 1:00 meeting (which I will be a few minutes late for, but since I’m second on the agenda, it will be OK). 1:07 p.m. Arrive at meeting in time for 1:10 p.m. presentation. Presentation goes fine. Continue afternoon with a few meetings. 5:05 p.m. Leave work. Stop at UPS on the way home to pick up the other package requiring a signature. 5:50 p.m. Arrive home and give up on a real dinner. Popcorn, chocolate chips, and a glass of wine for dinner. Daughter wants to paint my face and boys are off to a Cub Scouts event. 7:30 p.m. Everyone is home — some TV time and then off to bed. Kids asleep by 9:30 p.m., adults shortly afterwards. 5:30 a.m. Wake up and enjoy some quiet time and coffee. 6:45 a.m. Leave for the gym. 8:50 a.m. Return just in time for the boys to go to martial arts. Spend time with daughter and make an omelet (eggs and veggies, no cheese) for breakfast. Daughter eats a gluten-free bagel with Trader Joe’s Everything Bagel Seasoning. It might be the greatest food add ever. 10:10 a.m. Boys are home and we all relax for a bit. Go out to lunch downtown later and then run some errands at a few stores. 3:00 p.m. Back home, kids play outside with neighbor and burn off energy. We relax and prep for dinner, do laundry and general clean up of the house. We have a cleaning person come every two weeks and it is showing the need at this point. Only a few more days until she comes back! 8:00 p.m. Start bedtime routine. 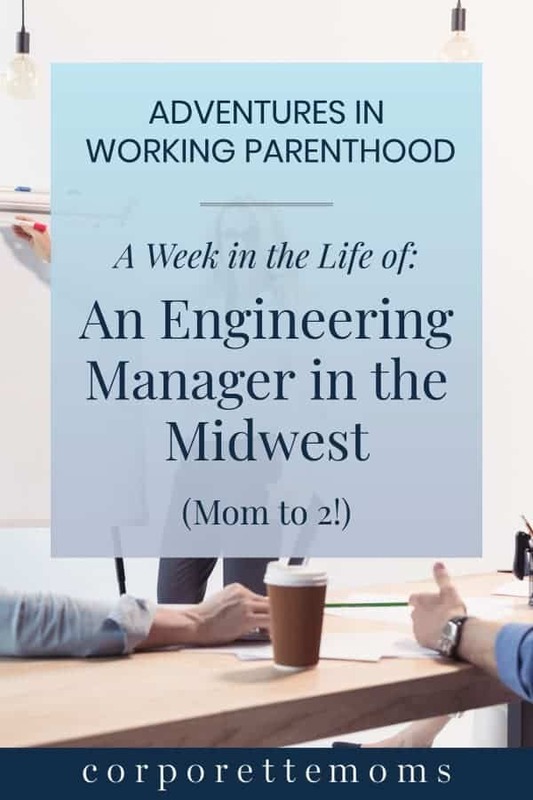 Thanks so much to A for sharing a bit of her life as a working mom! 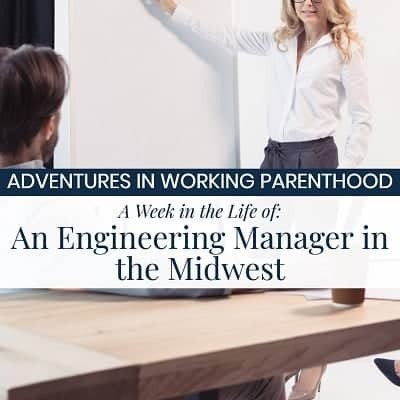 Readers, what’s your biggest takeaway from her week of work as an engineering manager as well as her general work/life balance? Stock photo via Deposit Photos / NatashaFedorova. I am in awe! You really are doing it all: parenting, working, giving back to the community, exercising. You are juggling a lot and doing it well. Dinners are my failure. Weeks my parents are around are much better. I’m in awe of those of you who have family dinners most evenings!!! Wow! I want to be your friend, you are really inspiring! I love the many ways you’ve found to incorporate your STEM talents into your day – work, kids activities, volunteering, etc. So cool. Can you talk more about the nanny/parents arrangement? How did you find someone who could do before and after school? Does she pick up your kids from school and bring them home? Does she start dinner? And how do you coordinate the times when your parents are there? We are really fortunate with our nanny. She has grown kids and agreed to watch my son when he was born for 18 months. I try not to remind her the 18 months is up!! She is really part of our family. She gets the kids ready for school and picks them up. Also, she takes them everywhere in the summer! No cleaning or cooking, but the kids love her like another mom. Some people think I’m crazy, but I tell them I’d rather my kids have two moms than one part-time mom. My parents moved here about a year ago. They travel a lot, but when they are here, they help out a lot. For engineers, we really don’t plan out how things will work each day (shocking, I know), but take it one day at a time and adjust as needed. Wow! Someone I can relate to! Except I have no nanny and my work hours are not flexible at all. But same with the restricted diet, the meal prepping, the Girl Scouts, the community activities! Also super impressed with your gym commitment. You mentioned your husband as motivation – does he also get gym time? You are super inspiring, keep it up! Love your commitment to exercise. I’m with you. Just curious if your husband has a regular time for exercise or other maintenance each day and how you balance that for both of you. I tend to take mornings and my husband evenings, which naturally fits our body clocks very well. Your friend’s comment about exercise being like brushing your teeth reminded me of something Michelle Obama said in an interview once. (Paraphrasing): I get up early to exercise because it’s important. I realized I wouldn’t think twice about keeping an inconvenient commitment for my kids, and I deserve to give that much attention to my own needs too. Major props to you for 4:30am workouts! I also really love your work to be a role model for girls in STEM, I wish I’d had someone like you to look up to as a kid. I had the stereotypical falling out with math in middle school. I was good at it, but I was also good at writing, and math was for boys. Wow! Super impressed with the early exercise. Also the meal prep, I think it will be helpful as the kids get older (teens) and they can be involved in what is made each week.